Skimming through the entries in our Encyclopedia, at least one group of truly American loons seems to be strikingly underrepresented: the bigfooters. Oh, yes, we’ve covered Mark Russell Bell, who is pushing an updated version of the Bible that also includes information on bigfoot and UFOs, and the good Arthur David Horn had some ventures into that territory before he discovered Zechariah Sitchin and David Icke. But when it comes to real, serious bigfoot researchers, we haven’t got much. Give a warm welcome, therefore, to Rick Emmer. Emmer is the author of Bigfoot: Fact or Fiction, and apparently hasn’t quite mastered the distinction suggested in his title. 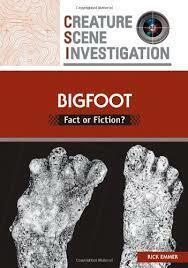 As with a lot of Bigfoot hunters, Emmer claims that bigfoot was first discovered by Leif Eiriksson during his discovery of Newfoundland – there is no textual evidence for such claims, of course, but that doesn’t prevent Emmer from quoting … something (almost certainly Peter Byrne, another bigfoot crackpot and the author of The Search for Big Foot: Monster, Myth or Man? since Emmer, like Byrne, claims that Eiriksson called the native population “skellrings”, when they would have used “skrælings” or “skrellings”, a typo that would have been obvious if Emmer had gone to a primary source or translation done by a real historian instead of crackpot rantings by a fellow lunatic). The real sagas contain no trace of any encounter that can be interpreted as even remotely “bigfooty”, but why go to the primary sources when mining your own deranged imagination is so much more fun? The rest of the scholarship of the book is of comparable quality. As a matter of fact, Emmer might not quite fit the bill as a bigfoot fanatic. It turns out that he has actually written a whole series of cryptozoology books with the title “X: Fact or Fiction”, where “X” is “kraken”, “megalodon”, “giant anaconda” and – but of course – “the Loch Ness monster” If he had applied a minimum of rigorous scholarship and intellectual honesty, these would all have been very short books consisting mostly of the word “no” (without bothering to double check I assume that the megalodon in question is supposed to be a currently existing megalodon, an idea famous from several Discovery Channel docufrauds). Diagnosis: Oh, well. We suspect that Emmer isn’t much of a loon when push comes to show. But his fans clearly are, and if you weigh Emmer’s contributions to humanity he’ll be found sorely wanting. He is a Leftist with a 'Racialist' viewpoint. He offers a different view to the mainstream and can be quite interesting. But he believes in Bigfoot!